Editor’s note: Ezra Galston is a VC at I2A Fund, a young entrepreneur at Foundation Capital, a Kauffman Fellows Finalist and a second-year MBA student at Chicago Booth. He focuses on early-stage technology investments. Follow him on Twitter @EzraMoGee. It seems like nearly every tech business has sought to employ a subscription model for its services. While that makes sense from a business perspective, I wanted to investigate any effects of subscription fatigue on consumer commerce – questions such as whether a service like Dropbox might be on the chopping block if consumers’ wallets are stretched. Or whether Gmail plugins like Boomerang could sustain a subscription model. Or even whether consumers care about the curated boxes that seem to be so prevalent on AngelList. I discovered that consumers have mentally budgeted over 240 percent more for monthly subscriptions than they’re currently spending. More importantly, they actually underestimate the amount they spend each month, supporting the notion that once locked in, consumption becomes painless. Lastly, there is a willingness to pay (WTP) for free services such as Gmail, Facebook and YouTube, which suggests big market opportunities for companies looking to build on top of or enhance these experiences. I conducted the survey at business programs at the University of Chicago, Northwestern, Berkeley, Columbia, and the University of Pennsylvania. The survey reflected more than 100 opt-in respondents, 96 percent of whom are between the ages of 23-33. Though significant, the sample is not representative of a diverse national audience. Rather, it represents a tech-savvy, early-adopting and fairly affluent class, and a frequent early-adopter target. Polling stemmed from a personal curiosity about consumer subscription fatigue. While I am aware that my findings are not demonstrative, it’s my hope that they spur additional research into the subject. Across the sample, respondents estimated spending $18.65 per month on current subscription services, such as Amazon Prime, Dropbox Pro, Spotify, etc., but noted a willingness to spend over $45 monthly long-term. Specifically, 86 percent of people noted an interest in increasing spending with only 5 percent suggesting they plan to cut back. While not surprising, there remains a huge growth opportunity for companies, such as Dropbox Pro and Spotify, with the former showing only 27 percent coverage across the sample. It is inevitable that many of its current non-paying members will be forced to convert, as consumers carry increasingly large amounts of data. Strong numbers for Spotify/Pandora One also suggest that the sample is willing to pay for convenience – whether that be greater mobile accessibility or reduced advertisements. Tapping into behavioral economics, the total spend of the self-reported services represented in the above graph, in addition to spending on services such as Birchbox, Dollar Shave Club and Trunk Club, implied that the polled sample was spending $23 per month on these products. This is significant deviation from the self-reported/estimated $18.65. Overall, it would appear that respondents underestimated their monthly subscription spending by over 50 percent, supporting theories from the likes of Phin Barnes at First Round Capital on the value of opt-out economics. Also noteworthy was the relevance of curated shopping services and boxes, which showed strong coverage, subscribed to by over 13 percent of the sample. Leading the pack was Birchbox, with services such as JustFab and Dollar Shave Club also showing some consumer interest. One finding regarding curated subscription services was that only a single individual subscribed to multiple monthly goods deliveries, but the sample is too small for this to be significant. I hadn’t seen much research on how consumers value everyday free services from a financial standpoint and therefore surveyed their willingness to pay for the above services at the risk of losing them. Gmail’s strong WTP of $5.60 per month suggests two things to entrepreneurs and VCs – first, that consumers would be willing to pay for plug-ins that greatly enhance their email experiences, and secondly, as Paul Graham suggested nearly a year ago, that it is long past due for email to be disrupted, with such changes potentially even adopting a paid model. This data lends a lot of credibility to the momentum in adopting freemium pricing models, and suggests that monetization within traditionally free products has a lot of room for growth. That said, consumer WTP will decrease where comparable products exist for free – so WTP in this sense is an indicator of added value, but not necessarily a realistic price point. Other services that command lower WTP metrics are suggestive of a lack of consumer affinity to those products. For example, eBay’s low-consumer WTP of $0.11 per month is possibly reflective of the emergence of vertical specific marketplaces such as Etsy, AutoTrader and Airbnb, which have built strong communities and momentum around themselves, reducing reliance on eBay’s liquidity. Twitter’s true value also requires more research. Its ranking well below those of Facebook, Wikipedia, and Yelp implies that consumers find it less indispensable than those of us living in the tech world. Alternately, its lower marks could reflect considerably lower consumer penetration, but that is somewhat unlikely given the sample’s demographics. Of particular interest to me is that not one of the study’s respondents suggested a willingness to pay for Foursquare or Tumblr. Though these are both big companies with significant levels of engagement, it’s a worry if consumers don’t consider you “vital.” And while that shouldn’t be of huge concern for Foursquare, which is planning to monetize through hyper-local search rather than upselling digital products, it is indicative that the fight for local search dominance is still in its infancy with consumers not fundamentally loyal to any service. And perhaps Tumblr’s low performance in this study is reflective of its heavy focus on teens/college students – which goes against the MBA bias of this poll. Still, the divide between Google’s WTP and those of Tumblr and Foursquare should raise some concerns about those services’ levels of indispensability. When it comes to hyper-local commerce, players such as Yelp and Foursquare still have to contend with the power of traditional social sharing as evidenced by the importance of personal recommendations. 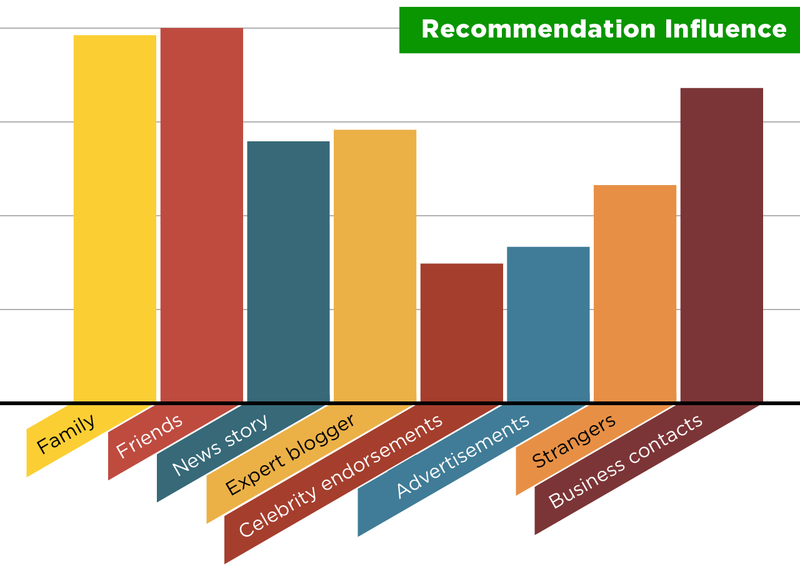 I wanted to test the relative impact of different forms of recommendations, expecting to replicate the findings of Battery Ventures’ 2012 Social Commerce Study but came away with some marked differences. As would be expected, social shares from friends and family polled as the most impacting on ultimate purchase, but the study found a significant departure from the Battery e-commerce study in that recommendations from business contacts as well as reviews from expert bloggers were valued as more likely to cause consumers to subscribe to a service than news media stories about a product or service. This finding is almost certainly a result of the sample’s bias towards business school students. Yet another difference was found in the weight given to recommendations from strangers on services such as Amazon and Yelp versus online, print, and TV advertisements. The Battery study found these reviews to be less meaningful than advertisements, while this study found the exact opposite. In my mind, authentic reviews – whether of local businesses on Yelp or driver experiences on Uber – are of significant value to consumers, and it’s important to consider the value of this conflicting data point. My original hunch on this discrepancy was demographic- and income-based, but drilling deeper into Battery’s data shows their findings mostly holding up both in the 18-34 demographic and among consumers earning more than $50k per year. Given the hundreds of millions of dollars being invested into social commerce, these are nuances that really matter and will require more research and discussion. I’m certainly open to any feedback. Overall, the survey results do suggest tremendous growth opportunity within subscription commerce, but caution that distribution channels and recommendations are key. 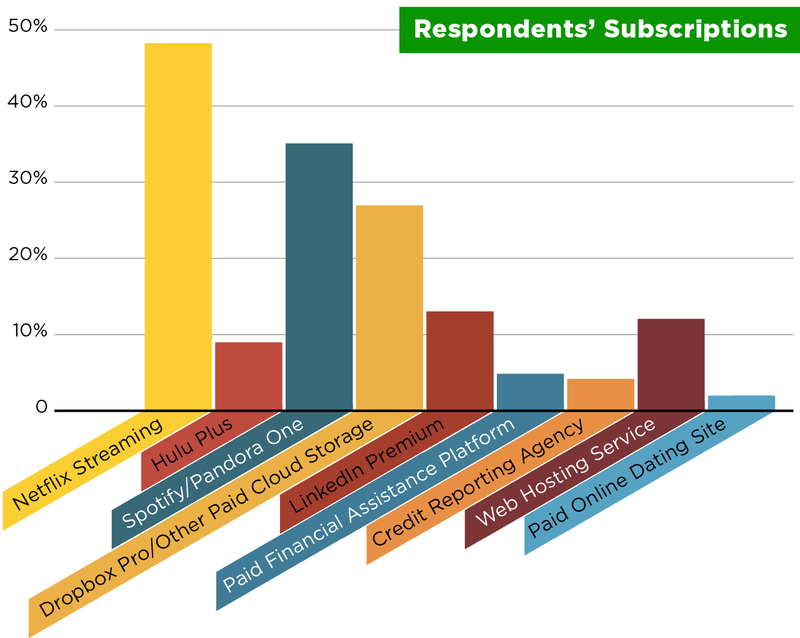 Consumers appear to like subscription services, even finding the monthly payment process painless. That said, the results are suggestive that the space is still in its early stages and there’s plenty of room for innovation and disruption. Special thanks to Imraan Ahmed, Mark Loewenstein and Kent Hall of the Foundation Capital Young Entrepreneurs Program for helping distribute the survey at their universities.